A jihadist rebel group in Syria has called on its supporters to attack rival opposition factions that do not support its cause. The call by the al-Qaeda-linked Islamic State in Iraq and the Levant (ISIS) follows days of rebel infighting that has left scores dead. It came hours after another rebel group called on ISIS to observe a ceasefire. 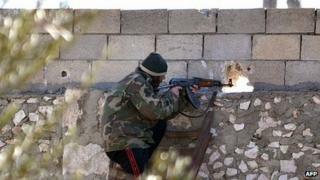 The al-Nusra Front said the factional fighting benefited the government of Syrian President Bashar al-Assad. Opposition activists say some 270 people have been killed in factional fighting since Friday. Clashes are continuing in Raqqa, a city under full rebel control and previously an ISIS stronghold. BBC world affairs correspondent Mike Wooldridge says the damage being done to forces opposing President Assad was clearly recognised in an audio message from Nusra Front chief Abu Mohammed al-Julani, in which he called for a truce. "The regime will gain new life when it was close to collapse," he said in an audio message posted on Twitter. "(The fighting) risks costing us dearly on the ground if it continues." He accused ISIS - also known as ISIL - of having a "flawed policy" that had played "a key role in fuelling the conflict". The al-Nusra leader proposed an initiative to end the fighting that would include a ceasefire, a prisoner exchange and setting up an Islamic committee to mediate disputes. However, a defiant ISIS audio message later urged its fighters to attack other rebel groups. Spokesman Abu Mohammed al-Adnani - although making no reference to the al-Nusra initiative - called on the militants to "crush them (the rebels) totally and kill the conspiracy at birth". He also threatened all members of the main opposition political grouping, the National Coalition. "Everyone who belongs to this entity is a legitimate target for us, in all places, unless he publicly declares his rejection of that group and of fighting the mujahideen," he said. ISIS, formed in April 2013, grew out of al-Qaeda's affiliate organisation in Iraq and has since become one of the main jihadist groups fighting in Syria. It has gained a reputation for brutal behaviour in the areas it controls. The SNC is itself deeply divided and on Tuesday postponed a vote on whether or not to attend a peace conference in Geneva planned for 22 January. Earlier on Tuesday, activists in Aleppo told the BBC that militants from ISIS had summarily executed at least 50 captives who included medics, local journalists and members of rival rebel groups. The UK-based Syrian Observatory for Human Rights also said that at least 34 foreign jihadists had been killed by rival rebel groups in Jabal al-Zawiya, in north-western Idlib province. None of the reported killings can be independently confirmed. Since last Thursday, large-scale attacks by an alliance of rebel groups have been taking place across northern and north-eastern Syria on ISIS strongholds and strategic positions. Scores are said to have died, including civilians. The alliance says the offensive is driven by public anger in ISIS-controlled territories over practices including strict interpretation of Islamic laws as well as the kidnapping of journalists and torture of prisoners.